My name is Isaac Makos and I’ve traveled to the past every summer for the last five years. Public history appeared on my radar when I worked for two summers as a living history intern at Fort Necessity National Battlefield. 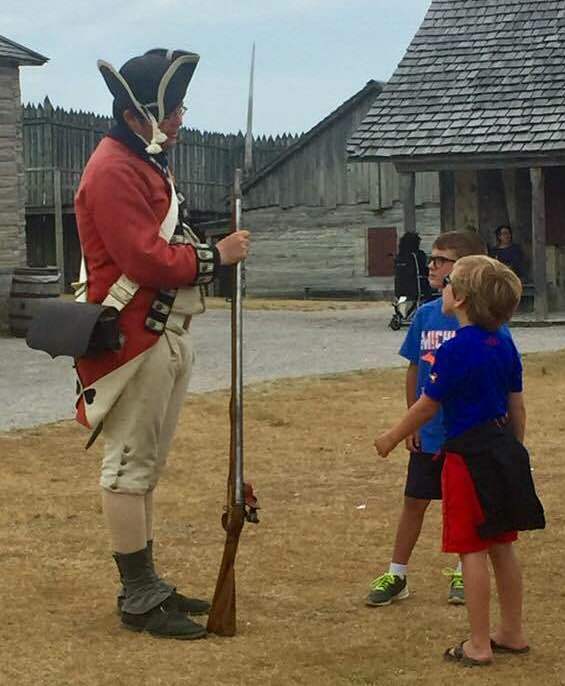 I dressed in the uniform of a Virginia militiaman, talking to visitors at the only French and Indian War battlefield in the National Park Service. My family was a frequent visitor to national parks and historic sites, but I hadn’t given much thought to the people who were giving the tours and answering the questions until I became one myself. That experience set me on a path that has led me to pursue a Master’s in Public History from American University. Working and interning in the public history field has also taken me around the country, from Farmington PA to Harpers Ferry WV to Ticonderoga NY to Mackinaw City MI. Along the way I learned skills from both past and present: I was trained to load and fire a black powder musket, and I also completed a digital history project during an Honors Term at my undergraduate college. I decided to pursue a Masters in order to improve my understanding of public history from both the theoretical and practical sides. Earning that degree in Washington, D.C. gives me the chance to learn and practice public history in one of the richest concentrations of history in the United States. In this History and New Media course specifically, I’m hoping to come out of the course with more knowledge of how to integrate physical and digital interpretation. I’ve seen historic sites experiment and try to find ways to use the centrality of smartphones and the Internet in daily life to their advantage, and enhance the educational potential of the site. After this class I hope to be able to contribute to those conversations in meaningful ways. I’m fascinated by the relationship between the public and digital history. How does the “average person” use the various forms of new media in the context of history? What can historians, especially public historians, do to leverage existing digital relationships between people and history, or build new ones? I hope to emerge from this course with a better idea of what the answers to those questions might look like.